Hanging laundry is a boring chore, so adding some whimsy to it is a welcome enjoyment. New clothespins have been designed that turn to little colored stars, strung along a moonlit clothesline, powered by the sun. Designers Idan Noyberg and Gal Bulka are the creators of the ‘Lightly‘ clothespin. 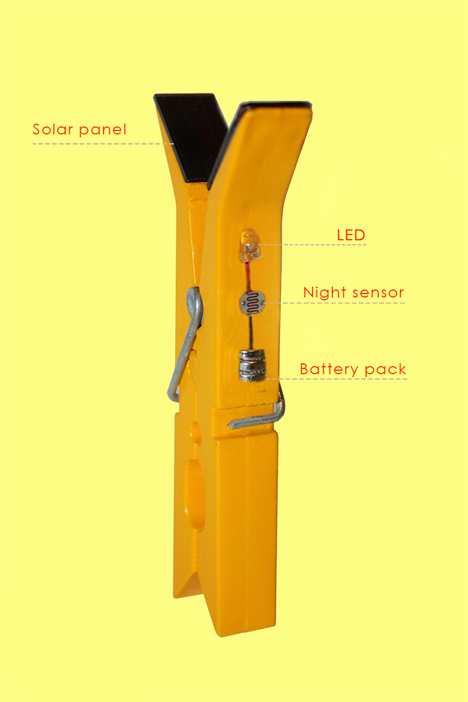 When simply clamped onto clothes on a clothesline just as one would with wooden pins, the Lightly’s miniature solar panel collects power. The setting sun then alerts the darkness sensor and an LED light is lighted. When used in large numbers, it adds a Van Gogh-like romanticism to the quiet, starry night.